This lesson revolves around Sherman Alexie’s poignant yet humorous and accessible essay, “I Hated Tonto (Still Do).” It explores the negative impact that stereotypes have on the self-worth of individuals and the damage that these stereotypes inflict on pride in one’s heritage. The reading is supported by a short video montage of clips from Western films. The clips offer students the opportunity to evaluate primary sources for bias and bigotry, as well as providing context for the protagonists’ experiences in the essay. Identify stereotypes that have been traditionally applied to American Indians in film and popular culture. Understand how popular culture perpetuates stereotypes to excuse systemic discrimination. How do prevailing stereotypes affect the self-worth of individuals who are labeled by them? How do dominant groups use stereotypes to “write” history? A short compilation of movie clips such as How Hollywood Stereotyped Native Americans that captures how American Indians have been historically portrayed in popular films. In this lesson, students identify stereotypes commonly applied to American Indians and think critically about how certain groups benefit from perpetuating stereotypes. Students can extend their understanding by formulating a mock interview that tackles the lesson’s essential questions or drafting a letter to protest stereotyping in today’s media. Review Jay Silverheels or Tonto. for background knowledge about Tonto and the American Indian actor, Jay Silverheels, who played him. Read “How Stereotypes Undermine Test Scores” for more insight about the psychological harm of stereotypes. stereotype [ ˈsterēəˌtīp; ˈsti(ə)r- ] (noun) An often oversimplified or biased mental picture held to characterize the typical individual of a group. 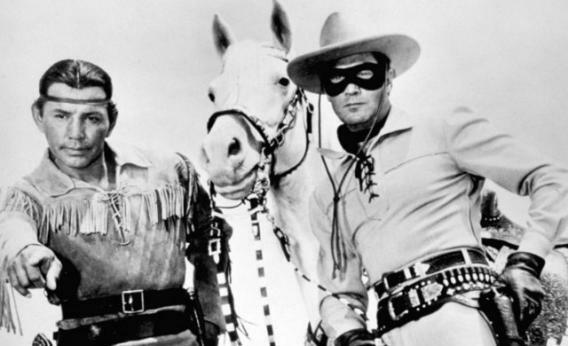 Tonto was the trusted sidekick of the Lone Ranger, the star of the widely popular Western television show of the same name that aired on ABC in the 1950s. Most “Indian” characters featured in other popular television shows and movies of the era were played by white actors. Jot down your ideas in your notebook. After brainstorming for a few minutes, share your theories with the class. Display theories on the chalkboard or on a large poster. 2. Consider one more fact: The author of the essay is also American Indian. Does this new data change your theory about the title? Why or why not? As a class, determine if any new theories need to be added to your list and cross off invalid theories as needed. How did Westerns commonly stereotype American Indians? How did Westerns commonly stereotype whites? Why are the American Indians interviewed in the video critical of Westerns? Share your answers with a partner, then pair up with another partner team. Compare your answers, and work to come to a consensus about the best answers. 4. As a class, decide if the clips—primary sources—support or weaken any of the theories you have collected about the impetus (motivation) behind the title of the essay. How did portrayals of American Indians contrast with portrayals of whites? How did the stereotypes that Alexie saw in the films affect his self-worth? How did stereotypes that Alexie saw in the films affect his feelings toward his people and heritage? 6. Count off around your circle from A to D. Using the fishbowl technique, A’s with your desks form a smaller circle (the fish/participants) within the larger circle (the on-lookers/audience), to discuss your findings and reactions to question “How did portrayals of American Indians contrast with portrayals of whites?” (Note: As long as the focus question has been explored, the participants in the small circle are free to share their views on other aspects of the essay, and encouraged to raise their own questions about the essay or ask one another to share opinions on a related issue.) Have the B’s take the place of the A’s in the inner circle and repeat the discussions and reactions for the next question from Step 5 (b). Continue with groups C and D, until all the questions have been explored. 7. Revisit your initial list of theories. Revise as necessary or simply star the “winners.” What did you discover? Did you learn anything new? Explain. Write a reflection on what you learned and how this new awareness may affect you. 1. Alexie’s essay highlights the harm that stereotypes can inflict on an individual and on a people. So why were these Westerns, riddled with blatant stereotypes and historical inaccuracies, so popular? Put another way, if American Indians were harmed by the making and viewing of these distorted films, how did white audiences and white filmmakers benefit from the use of stereotypes in Westerns? Conduct research with a partner (or two) to obtain a historically accurate picture of the clash between American Indians and white settlers during the nation’s period of westward expansion. Think critically about how your findings “answer” the guiding question above. Translate your findings into an “interview” with an historian similar to the ones you viewed in the clip earlier. Use a question-and-answer format. Most questions should begin with “how” or “why” and every answer should be substantiated by specific facts from your research and your analysis. Perform your “interview” for your class or two other partner teams. 2. Alexie wrote about movies made in the 1950s through the 1970s, but how prevalent (common) are stereotypes in media today? Your task is to conduct research to find out. To prepare for this activity, conduct a brainstorming session to identify which social groups are most commonly labeled with stereotypes, for example “girls and women.” Write the list on the board and in your notebooks. Using the list you generated, choose one group to focus on, keep a journal and briefly record the date and source every time you spot a stereotype about one of these groups in the media. In addition to considering movies, examine commercials, television shows and videos. Recall that Alexie was not critically aware of the stereotyping until he reached adulthood, and that he “cringed” when he revisited one of his favorite Westerns. In your journal, discuss whether or not you were surprised by your research. Note how viewing these pieces of media affected you emotionally. Also, explore how other audiences may be affected by viewing these images. Choose one example from your journal to examine more deeply. (Ideally, choose an example that plays on stereotypes about a group to which you belong or share close ties, such as “people who live in the South,” “girls and women,” or “people who come from low-income neighborhoods.”) Record as much detail as you can about the appearance and behaviors of the stereotyped character, and take note of how other actors are responding to that character. Determine what messages this piece of media is sending audiences about the stereotyped group. Draft a letter to the producer of your media example protesting the use of stereotypes. Using the facts you gathered, include analysis of how their media draws on stereotypes. Educate the producer about the harm that stereotypes can inflict upon the audiences who receive them. Or, if you are more artistically inclined, like Sherman Alexie, create a poem or a comic that achieves the same objectives.